With the Call of Duty: Modern Warfare 3 release date now just a little more than a month away developer Activision has released three new Call of Duty: Modern Warfare screenshots. 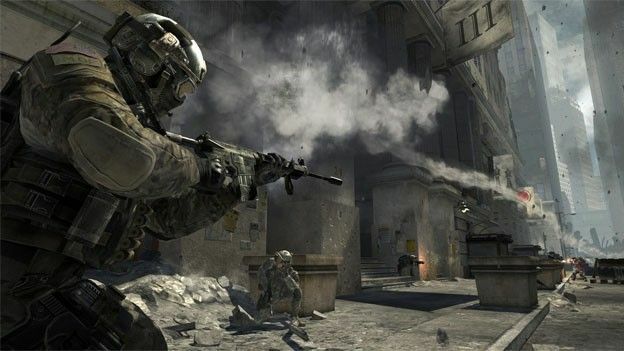 Offering a tantalising new look at the New York City level of Call of Duty: Modern Warfare 3 title the newly unveiled gameplay screens offer a sneak peak at the widespread destruction and grand scale of levels gamers can expect from the upcoming first person shooter. Set to hit stores on Tuesday November 8th, the Call of Duty: Modern Warfare 3 release date is to see retailers prise open their doors for midnight openings across the country as eager gamers brave the winter weather to be one of the first to snap up the latest addition of the Call of Duty franchise. Targeting the coveted gaming chart Christmas number one slot the Call of Duty: Modern Warfare 3 launch is to take place less than two weeks after the October 28th Battlefield 3 release date as well as going head-to-head with the likes of FIFA 12 and Forza 4. Have you already pre-ordered your copy of Call of Duty: Modern Warfare 3 or are you prepping to line up for a midnight opening? Let us know via the comments box below.